A star-studded list of celebrity guests, amazing musical performances, and of course, tons and tons of slime, yup, we’re talking about the one outstanding event that was truly the night’s trending topic and it continues to be the talk of the town for the rest of this month, it’s the epic 2017 Nickelodeon Kids’ Choice Awards! Every year, fans from all over mark down their calendars and wait for one of the biggest and most exciting events of the year, the Nickelodeon Kids’ Choice Awards, which celebrates kids’ love for all things in pop culture: from music, movies, TV shows, social media, and more. The remarkable and stupendous 2017 Nickelodeon Kids’ Choice Awards made its way to the USC Galen Center in Los Angeles, California yesterday, March 11, 2017 for one unforgettable and terrific night for attendees and all viewers. The Nickelodeon Kids’ Choice Awards is known for an endless amount of awesome surprises and there wasn’t a dull moment throughout the exhilarating award show. As soon as the award show started, fan-favorite actor, Jace Norman, who also happened to win the “Favorite Male TV Star” award at the KCAs, went straight from the Henry Danger set to the orange carpet for a fun live opening to the award show where he passed on the mic to host John Cena to get the show started with a whole lot of fun. With an award show as magnificent and full of energy as the Kids’ Choice Awards, there is one perfect person who can take on the role as host in such an effortlessly cool and sensational way, of course, it is none other than the legendary WWE superstar John Cena who got everyone watching the KCAs up on their feet and screaming with excitement. This year, fans were able to interact with the KCAs more than ever. Everyone was able to vote to see what happened during the live show of the KCAs including seeing Jack Griffo and Kira Kosarin take on the “chubby bunny” challenge, seeing Big Sean and Bethany Mota throw shirts out to the audience, and the Nicky, Ricky, Dicky & Dawn cast take on an adrenaline-filled arm wrestling challenge against John Cena that was judged by the one and only, DJ Khaled. Of course, the Nickelodeon Kids’ Choice Awards isn’t complete without a ton of slime moments! A total of five, phenomenal slime attacks happened at the KCAs. Demi Lovato was slimed during her Smurf-sational segment. Chris Pratt even got slimed at the KCAs control room and the Power Rangers cast got some slime action of their own. The one and only, profound actor Kevin Hart took home three blimps for “Favorite Villain,” “Most Wanted Pet,” and “BFFs,” and Nickelodeon couldn’t allow Kevin Hart to get off the stage without being covered from head to toe in green slime. The grand finale of the Nickelodeon Kids’ Choice Awards ended off with the iconic John Cena getting a slime dousing as another remarkable KCAs came to a close. Every year, the Nickelodeon Kids’ Choice Awards brings everyone an indescribable amount of joy and happiness. Nickelodeon events always capture what it’s like to be a kid and be a kid at heart in such an exciting and enjoyable way. Nickelodeon events, like the Kids’ Choice Awards, celebrate what kids love and show that the best thing is to enjoy your childhood and the things that even as an adult, make you think and feel the happiness of being a kid. The Nickelodeon Kids’ Choice Awards was yet another awe-inspiring masterpiece this year. If you missed the Nickelodeon Kids’ Choice Awards or would just like to enjoy all of the fun all over again, there will be special replays of the KCAs on TeenNick on Monday, March 13, at 7:30 p.m. (ET/PT) and on Nicktoons on Thursday, March 16, at 7:30 p.m. (ET/PT). The show will also be available on Nickelodeon On Demand March 12. 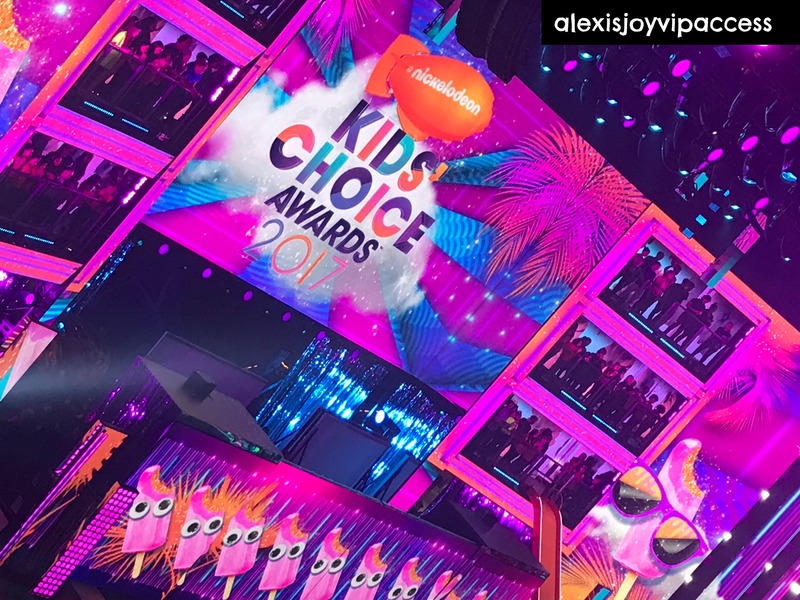 I, Alexisjoyvipaccess had the greatest, greatest honor of covering and attending the 2017 Nickelodeon Kids’ Choice Awards again for the third year in a row and had such a mesmerizing time at the incredible award show. Check out some VIPAccessEXCLUSIVE pictures below from the 2017 Nickelodeon Kids’ Choice Awards and stay tuned on YouTube.com/alexisjoyvipaccess for interviews with your favorite celebs at the event. Big thank you to the magnificent Nickelodeon for having me at the fun-filled Nickelodeon Kids’ Choice Awards again this year! Follow Nickelodeon on Twitter and Instagram: @Nickelodeon and visit Nick.com and the Nick App to catch up on all of the KCAs excitement! Check out the full list of winners at the 2017 Nickelodeon Kids’ Choice Awards below! Previous Article: Desiigner, D.R.A.M., Lil Yachty, Khalid, And More Join Rick Ross And Are Set To Perform At The 2017 MTV Woodies! Next Article: Megan Lee Is Headed To Perform At The South By Southwest Festival And She Will Totally Slay It!